My name is Tughunaka K Ayemi and I'm a student. I always wait for the opportunity to attend the leadership conference and awareness of global issue as to bring a great impact in my small town. 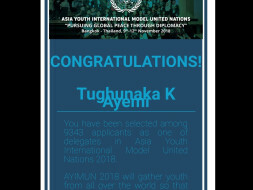 This time when I applied for 'Asia Youth International Model United Nation' (AYIMUN). 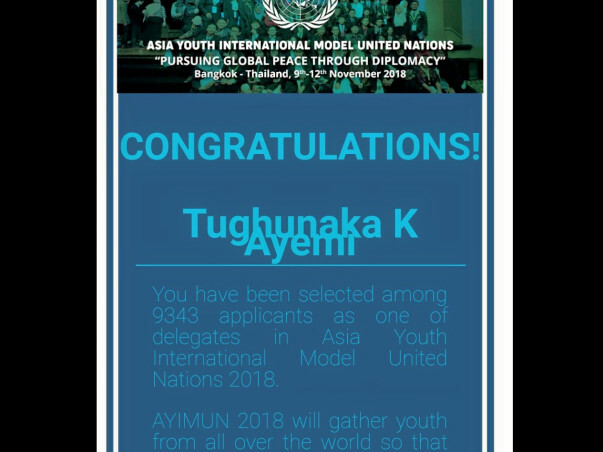 I recieved a message through my Gmail that I was been selected AYIMUN. It is a dream come true for a small town lass but on the other hand, I cannot afford the expenses for the Air Ticket, accommodation and Registration. I need your earnest support to let me join this prestigious conference that will be held in Bangkok (9-12 November 2018). the total costs for the conference including the registration + stay (400), Air ticket. Overall it would account to INR 60k. AYIMUN helps the young leaders to enhance critical thinking about global issues, to improve commuication and diplomatic skills.